Researchers at the University of Minnesota have regenerated a rat's heart in the lab hoping they can do the same for a human heart. 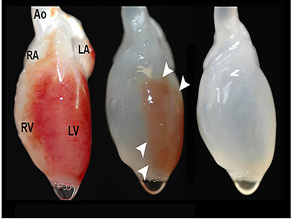 With a rat's heart, they removed its existing cell structure by washing it off with a soap solution much like shampoo. After this decellularization process, they introduced new heart cells from another rat and attached it to a machine that functions like a body - complete with blood supply, blood pressure and a pacemaker. "The first couple of days we didn't see much. By day four we actually saw tiny microscopic beating and by day eight it was the home run. We could actually see beating in the heart," says Professor Doris Taylor. Taylor and her team are now working with a pig's heart because it resembles a human heart in size and shape. An actual transplant to a human is still many years away but Taylor says it is a possibility. "It's not unreasonable to think that we could take a pig heart, remove all the cells and then if you needed a heart, take stem cells from your body, grow them in a dish and transfer them to a pig heart and make a heart that matches your body." Researchers also say the same process can be done for other organs like the liver and kidneys. What do you think? If you needed a new heart, would you wait until a suitable donor appeared or would you accept a pig's heart? Do you think stem cell research is the future or are there ethical implications? I am not against stem cell use if it is taken from discarded fetal sacs....I think their are many ethical questions and rules to be established because of human nature..but I welcome what stem cells can do for those suffering paralysis;brain injuries, diseases of the kdneys and heart etc......I think about this often as i have a sister who suffers paralysis from a car accident and would rejoice to see her walk independently again...and if stem cells can do that..why not? What is the harm for quality of life? Technology is obviously providing replacement parts. Makes one feel like in an auto store: "Muffler please." "What model? what make and year?" "1970 Mustang." "Too old, no parts in stock, have to special order. Foreign parts won't work." There will eventually be a time for one to say, that's it, stop changing my parts, I wanna hop into a new car. There are many amazing breakthroughs in medicine on the experimentation table. The problem is that it's a slow process. I'd like to think that it would be a reality by time I get to old age. Religion is a non-issue. It cannot make rules that apply to those who don't agree with their beliefs. That is forced religion and it's wrong both legally and morally. the bigger issue is should we do this considering the state of the world? We don't have the room or resources to support a huge population that would result from extended lifespans. We already have hundreds of laws on the books that FORCE people to live healthy in this country and I don't see any sign of it stopping. Every time someone is lost in an unfortunate accident, the families want someone to blame and new laws to prevent what is essentially, required. People must die. Though morbid, it's a necessity at this point. I guess the pig's heart is a stepping stone to being able to grow new human hearts. I guess the question is if it's better to have a human heart made of someone else's cells or to have a pig heart made of your own cells? We need to try brain transplants. Human to Elephant first ? Elephant to Killer Whale ? Pig to Human ? Greeks had the Minotaur, way ahead of our time ! When ever anyone is refering to stem cells the truth gets muddled. When you are talking about stem cells you have to be specific. There is a difference between embryonic stem cells, which many Christians have moral qualms about, and Adult stem cells. Adult stem cells are your own and that is what this procedure would use. No perceived life would be extiguished. And it must be said that embroynic stem cells are a hopeful idea but has had very little to no success in doing what scienctists and celebritys dream. Adult stem cells however has had significant success. Its your stem cells which means you dont have the problem of your body rejecting the organ. I do not see an ethical problem here. This is a wonderful breakthrough and will eventually help millions of people have more productive and healthy lives. Growing your own body parts is closer to helping one's self recover. You yourself are taking charge and taking control over your own body, now that is something! As far as religion, churches dont mind movin forward in adult stem cell progress, its embryonic stem cells that cause disagreement. Their hasn't been any outcome from embyonic stem cells. I don't know if i'd take a pigs heart, Its like having live bacon shoved down your throat. But if you could do a heart, what about a hand. If i had no hand, I'ld definitely replace it with a tiger paw. If the research is allowed to proceed without religious interference as manifested by how our politicians respond (or not) on the issue, we might have had cures for cancer, heart disease and other afflictions. Stem cell research holds the promise not to replace our faith in any or all gods or in our daily practice of religion, but to help ALL mankind, regardless of beliefs. Stop spending trillions on war and better our lives and our children. Wow...then if we eat too much, we can use truely say, "I'm pig'n out." Why not just let the person die rather than rake up the insurance premiums! I couldn't agree more with Shock Troop's assesment. If we keep increasing the average life expectancy in the world's population, eventually we're going to simply run out of room for people to live. I don't want to sound inhumane, but people have to die to keep our world as habitable as possible. Having 10 billion people (hypothetically) on Earth would cause us to more rapidly run out of non-renewable resources, as well as drain our renewables possibly faster than we can bring them back. We shouldn't stop researching new ways to prolong life, like medicines and surgery, because that could potentially start a population decline... Just learn when and where to apply them. Guess you must be giving some attention to soccer these days? Drop me a line if you see this.